Dead cat found in Manchester Road garden – can you help find the owner? 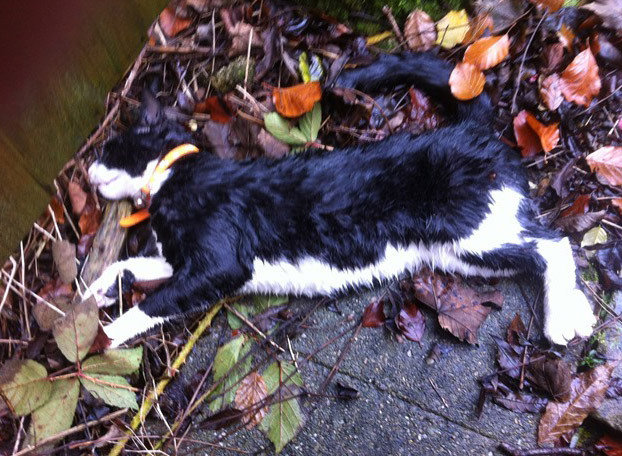 A dead cat has been found in a garden on Manchester Road near Den Bank Avenue. The black and white cat has an orange collar with bell attached. It has black fur on the back and sides plus a white nose, mouth and chin, white paws and white tummy. No obvious address was attached. There were no visible injuries, but it may have been hit on the main road and run into a garden. The person who found the cat has asked us to post this in order to alert the owners. If you are worried the cat may be yours then you can see a photo of it here to check. The council were due to collect the cat today. They will check for any microchip and try to contact the owner. If you are the owner, or know the owner, then you can also contact the council via the form on their website. The council reference number is 101001719494. This entry was posted in crosspool, lost and found, news and tagged cat, den bank avenue, manchester road. Bookmark the permalink. 1 Response to Dead cat found in Manchester Road garden – can you help find the owner?